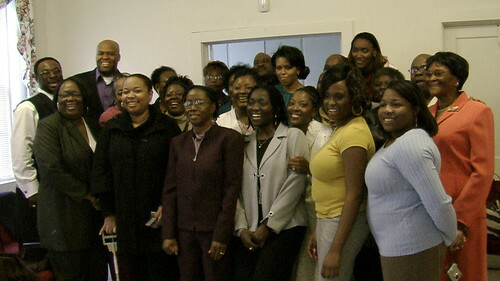 Michelle Obama (center), her brother Craig (left), and the extended Robinson family in Georgetown, SC this afternoon. While she grew up on the South Side of Chicago, Michelle Obama’s trip this afternoon to Georgetown, SC was really a homecoming. 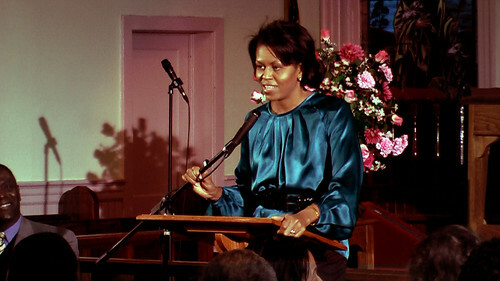 Michelle’s grandfather, Fraser Robinson Sr., was originally from Georgetown and, while she was growing up, Michelle and her family regularly spent part of their summers visiting their extended relatives in the Low Country town. 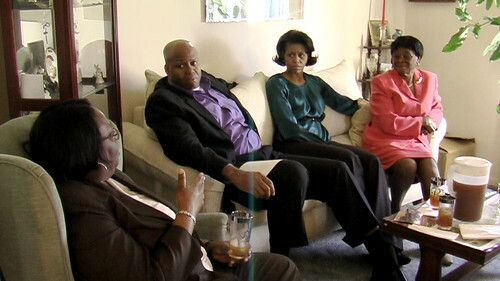 Joined by her brother Craig, Michelle’s afternoon in Georgetown started with a reunion and some sweet tea with her cousins Connie Jones, Dorthy Robinson, and Harolyn Siau at the Robinson family home near downtown Georgetown. 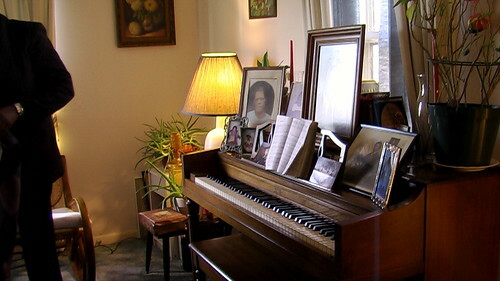 The meeting also provided Michelle and Craig with an opportunity to take a look at fmaily photos Cousin Dorthy keeps on top of her piano. 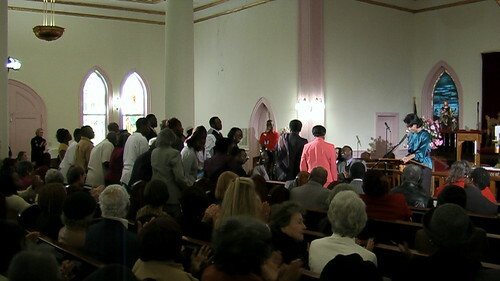 After meeting with her cousins, Michelle went down the street to her grandfather’s old church, Bethel A.M.E., in historic Georgetown, where she spoke to a packed house of South Carolina Obama supporters that included over thirty-one of her own family members from the area. During her speech, Michelle touched on the concerns that some have about whether or note Barack has enough experience to be President. While he may not have the long Washington resume of other candidates, Michelle noted, with Barack’s background as a community organizer in Chicago — working right along side the people he sought to help — and eight years as a State Senator (more years in the kind government that’s closest to each of us than anyone else in the race) in the rough and tumble world of Illinois politics, he clearly has the kind of experience that the country needs right now. The challenge for us is to ask, “What are we ready for?” This one is on us — see, we like to talk about change, but we don’t really like change. We want easy change, we want change that will make us feel comfortable, but that’s not how change happens, it’s not something that’s just going to come to you passively. Things aren’t gong to get better when you wish for it or you hope for it: Things get better when regular folks take action to make change happen from the bottom up. Every major, historical moment in our time it has been made by folks who said “Enough,” and they banded together to move this country forward — and now is one of those times.